The signs may be subtle at first: An older loved one no longer shows interest in something he or she used to deeply enjoy, or can’t keep up with the dishes or the laundry. Perhaps he or she stops making plans with friends or family or makes excuses to avoid going out as often. It can be easy to think of these changes as just a part of getting older, especially if a loved one has a serious illness that has deeply impacted their daily life like cancer, Alzheimer’s disease or Parkinson’s disease. But Amy Goyer, AARP’s family and caregiving expert, urges caregivers to take notice, as changes in behavior may be a sign of depression or a mental health condition. Mental health conditions like depression and anxiety pose a significant risk to older adults. In fact, the Centers for Disease Control and Prevention has identified mental health care for older adults as a priority in public health. In a report on mental health and aging, the CDC estimates that 20% of Americans 55 or older experience a mental health issue. The most common of these conditions is depression; other common conditions include anxiety, severe cognitive impairment, and bipolar disorder. In severe cases, a mental health condition can lead some to consider suicide or have suicidal thoughts, but mental illnesses can also affect memory and cognition, creating symptoms that may look like dementia or memory loss. For caregivers who may already be helping a senior with significant physical health issues, caring for their loved ones’ mental health can present an even more complex challenge that takes an emotional toll as well. Goyer knows these challenges personally. She cared for her mother before she passed away and now takes care of her father, who has Alzheimer’s disease. Her mother struggled with depression after suffering a stroke, and her father continues to battle depression and anxiety alongside Alzheimer’s. She notes that it can be hard for a caregiver to recognize the signs of a mental health issue in a loved one, especially if that caregiver is busy or overwhelmed. According to the CDC, depression is often misdiagnosed or left untreated in older adults because both healthcare professionals and caregivers may view changes in mood as a natural reaction to aging or other illnesses. At the same time, seniors may not recognize these changes in themselves as something that can be treated or realize that there’s a possibility they could feel better. In addition to mood changes, an older adult struggling with depression or another mental health issue may face feelings of hopelessness and pessimism, thoughts of suicide, changes in appetite and sleep, or frequent aches and pains that don’t improve with treatment. 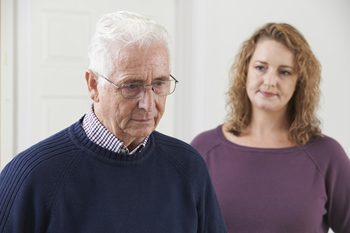 Caregivers who notice a change in a loved one’s moods or behaviors can help them seek a thorough evaluation from their primary care doctor or a psychiatrist or psychologist who may suggest medication and counseling. Geriatric psychiatrists, Goyer notes, may be more experienced in medication management for older adults with co-existing medical conditions. In addition to seeking treatment, Goyer says caregivers can look for ways to improve a loved one’s quality of life and really listen to what he or she needs in order to feel engaged with their community and family. “What are the things that have always given your loved one joy? What are the things that might make the difference for them?” Goyer says. Going on outings together, making sure a loved one can get to an event at a church or community center that he or she enjoys, or simply checking in each day with a short phone call can make a big difference. Caring for an older loved one who is suffering from depression or another mental illness can be physically and emotionally overwhelming. Some caregivers may feel guilt about taking time to enjoy their own lives and interests when a loved one is feeling hopeless and depleted. “The analogy I use is: ‘I don’t expect my car to run on an empty tank but I expect myself to.’ That doesn’t make sense,” Goyer says. However, self-care can be especially important when taking care of someone with a mental health issue. Taking time to walk in the park, to a movie or out with friends can be a restorative and refreshing break that fills a caregiver’s tank. Sometimes it may even be something a caregiver and a loved one do together. Text in to the Crisis Text Line (741-741) to talk over text with a trained counselor.